When it comes to Starbucks's autumn offerings, most people only care about the Pumpkin Spice Latte, or making fun of the Pumpkin Spice Latte. 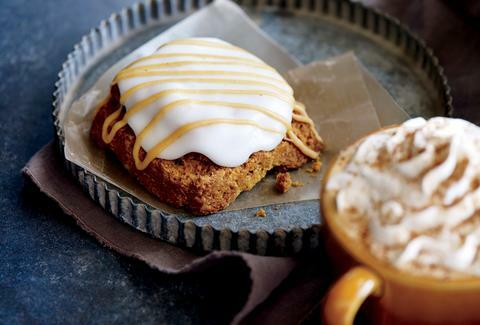 But Sbux is rolling out their entire seasonal menu -- and it includes a whole lot more pumpkin-flavored stuff. The Salted Caramel Mocha will be joining the PSL once again on the fall coffee selections, along with that Oprah Chai Tea Latte the Internet had so much fun with. As for food, the chain's got a Pumpkin Scone and Pumpkin Cream Cheese Muffin on deck. And, on the off chance you're interested in eating anything without pumpkin guts this season, there's also a Washington Apple Pound Cake. All of these items should be in a Starbucks near you starting this week, so consider summer officially over. Caramel Ribbon Crunch, we barely knew thee. Kristin Hunt is a food/drink staff writer for Thrillist, and is mentally preparing herself to smell nothing but cinnamon and cardamom for the next three months. Follow her at @kristin_hunt.